The 20th anniversary of INDUSMACH AFRICA will once again host some of the biggest names in manufacturing, supplies and industry consumers from Africa and abroad. INDUSMACH 2018 will take place in 2 of the fastest -growing economies on the African continent. The 20th edition of INDUSMACH AFRICA will feature an impressive selection of some of the most exciting companies from Africa and beyond, coupled with 3500+ visitors in attendance. This makes INDUSMACH AFRICA, the ideal platform for networking and tapping into East African markets and its immense potential, all under one roof. After 19 years and concluding 19 successful editions of INDUSMACH Africa, Expogroup aims to celebrate the 20th INDUSMACH with an even grander event in 2018. Bookings are now open, with prime locations at the exhibition up for sale. With a 20 percent, projected increase in exhibitor and visitor participation, INDUSMACH represents a big opportunity for business in East Africa. The exhibition this year will cover a wide range of products used in Industries today. Including Machinery Tools, Hydraulic Equipment, Automation, Machine Tools, Generators and many more. INDUSMACH remains a house-hold name in the East-African industrial circles, and is backed by several government organizations locally including the East African Chamber of Commerce Industry and Agriculture. Expogroup also boasts a reputation of being Africa’s leading organizer of trade exhibitions. Expogroup’s presence in Kenya is explained by the country’s close proximity to land-locked nations like Uganda and South Sudan, which depend greatly on Kenya for trade purposes. The markets in Tanzania and Ethiopia have also been recording some very impressive statistics and represent very promising markets for potential exporters and importers alike. INDUSMACH 2018 is seeking to bring big, medium and small industries all in one place and at one time, to provide participants at the expo with the widest possible selection of international and local companies to network with and build lucrative new business partnerships. INDUSMACH will be an ideal platform for participating companies to showcase their wares. “Indusmach 2018 will be the ideal platform for exhibitors, both local and international to showcase their products to the East African market as the event will continue to attract a large audience of local trade visitors and decision makers from Kenya and its surrounding nations”, said Trevor Daniel, Exhibition Manager, Expogroup Worldwide. In summation, INDUSMACH 2018 will be an international stage that will display the newest advancements made globally across the industry and tend to local as well as international players. INDUSMACH AFRICA signifies as a remarkable meeting place for manufacturers, suppliers and industry consumers and eye witnesses a notable array of leading companies from the Industrial sector. 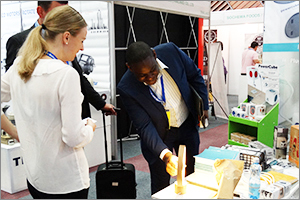 The expo is set to commence for the 19th edition at Kenya on 16 – 18 June 2017, at The Dome, Nairobi, with an exciting lineup of both local and international companies and is an ideal platform for product launches, finding new buyers & distributors, promoting brand names & image, updating existing customers and updating oneself with the latest in the industry. The mega expo is being organized by Expogroup Worldwide, organizers of the largest International trade shows in Africa. Though Kenya by itself is one of the biggest markets in Africa, major emphasis is being laid upon attracting traders and importers from neighboring countries. The experience and comments of exhibitors at previous events indicate substantial gains from unexpected foreign visitors and we strongly feel that a rise in such statistics would ensure business especially for the foreign participants who form almost 80 – 85% of the exhibition. Kenya is seen as a business hub in East Africa and has trade advantages that make it an attractive long-term location for business development. It has a stable political climate and has enjoyed continued economic growth for over a decade. We believe this collaboration will benefit the growth of supporting industries tremendously. Not only will it have the discovery of latest in the industry but also meet international and local companies. INDUSMACH is looking forward to gather, big, medium and small industrial sectors under one roof. Providing an opportunity to the participating companies to promote their products equipments and machinery to the wide African market. Thereby getting set to deliver outstanding value and quality for all investors involved.